The Canadair CL-84, begun in November 1963, was a quarter the size of the XC-142. It weighed 8,100 lb empty, could make a vertical take-off at 12,200 lb, or a shorttake-off at 14,700 lb. The wings were 33 ft long and housed two 1,450 shp Lycoming T53-LTC1K-4A turboprops which powered the cross-linked 14 ft four-bladed propellers. Pitch control was provided by two counter-rotating two-bladed horizontal propellers, which in horizontal flight were stopped and aligned to minimize drag. Roll control was by differential pitch, and yaw was controlled with ailerons. 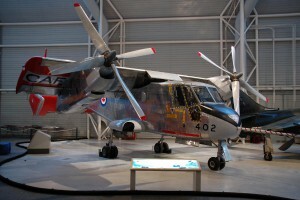 It made its first vertical flight in May 1965, and first conventional flight that December. A total of four aircraft were built, including one which was not flown. US pilots evaluated it extensively, including demonstrations on amphibious ships and the Pentagon helipad. Neither government was sufficiently interested to order production aircraft. Two aircraft were destroyed in non-fatal accidents due to mechanical failures. 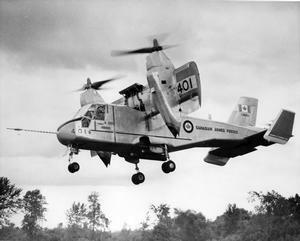 The tail rotor actually comprised two contra-rotating two blade rotors that provided pitch control in low-speed flight. In forward flight these wre stopped and aligned, fore and aft along the aircraft, to minimize drag. Resources related to the CL-84 Dynavert, provided by the Vertical Flight Society. Resources related to the CL-84 Dynavert, provided by public sources across the internet.